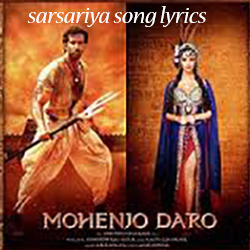 Sarsariya song lyrics from Mohenjo Daro (2016) sung by Sashaa Tirupati, Shashwat Singh, lyrics were penned by Javed Akhtar . Mohenjodaro is a forthcoming film of Bollywood which will be released in Ausust 2016. Celebrities Hrithik Roshan & pooja Hegde played as lovers in Mohenjodaro. This historic love story has been making by Ashutosh Gowariker (director), Siddharth Roy Kapoor & Sunita N. (producers) A.R.Rehman is the music director for this song. माँ से न न मया..
म से न न मया..